Back in the late 80’s I saved an article from the Minneapolis Star Tribune about ways to decorate eggs for Easter. One of the projects was beading eggs and it caught my attention. I have always been attracted to beads and had always wanted to learn to bead. So true to my nature, I kept that article hoping one day to actually make one of those beaded eggs. 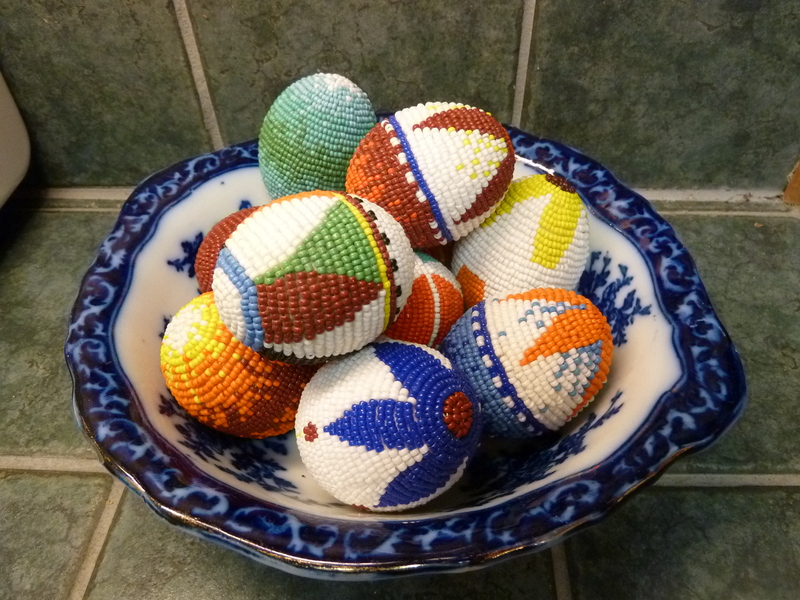 In 1998, when we came back to the states and moved to Palm Springs, CA I ran across the article I had kept all these years and decided it was time to make one of these beaded eggs. I had some beads from a craft store and started with a regular sewing needle and some sort of thread. I finished a few eggs quite quickly, but I struggled getting that sewing needle through the tiny bead holes. The beads that I was using were all irregular with some of the holes big and easy to get through and others quite narrow and gave me problems. I started asking people where I could find beads and servicemen that I worked with asked his wife and came back to me with the name of a quilting store that also sold beads. The next day was Saturday and I headed over there in search of beads. I walked in and found the bead section and started looking at colors and sizes. Someone came over and asked if I wanted help and one thing let to another and I found out they taught beading classes and there was one just starting. The class was for a bracelet and before I knew it I was picking out my beads, learning about beading needles and thread and I never looked back. I went home 6 hours later and showed my husband what I made. I had already signed up for another class and was so excited. 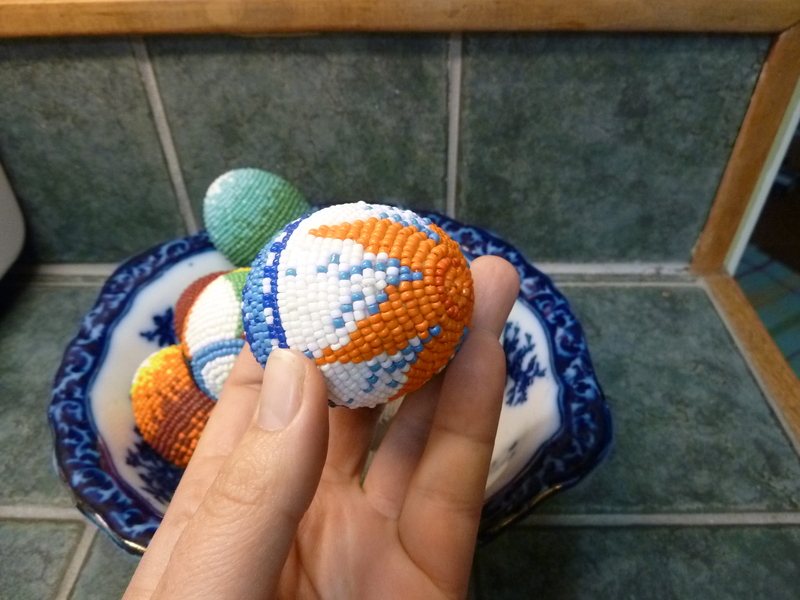 I also kept working on the beaded eggs. It was a lot easier with a proper beading needle – they are very thin and flexible. I also picked up some beads that were of better quality and were uniform shapes and sizes. After a few classes I was invited to join some of the beaders on Wednesday nights. They all got together after the store closed and just beaded together. They just brought in their own projects, beaded together and had fun. I miss these ladies and our beading nights. My life has changed so much since I left Palm Springs and we moved to S.Texas. I miss my days of beading, but I love what I am doing around the house and in the gardens. And I love my beaded eggs! 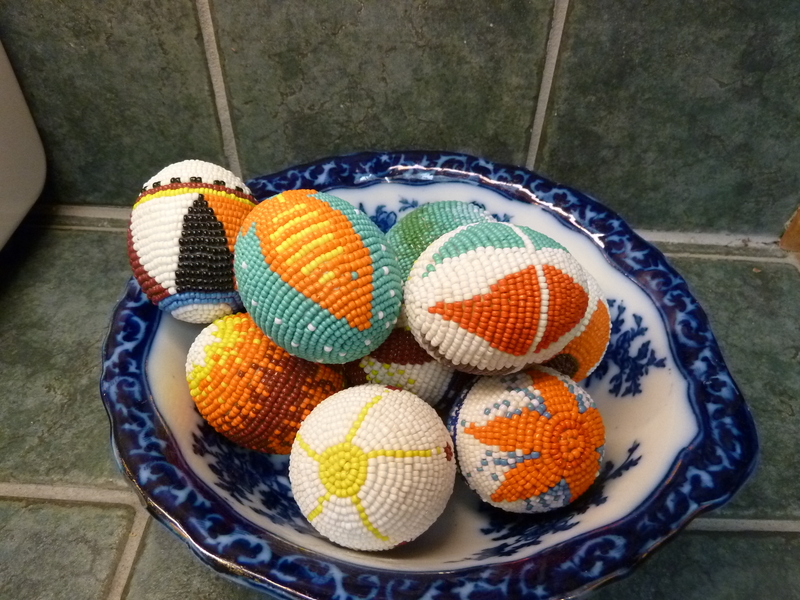 This entry was posted in Beading, Little things, Miscellaneous and tagged beaded eggs, beading, beadwork. Bookmark the permalink. I love the beaded egg! And miss the Desert beaders. And miss you too!!! Hi Deb! I miss the Desert headers a lot. I am glad we have computers and email to keep in touch! I know you get down there more often then I do to see everyone. That is SUPER cool. Now is there a real egg shell in there, or do you use some type of form? Beautiful. YES YES – there is a hollow chicken egg under all those beads. I want to take one of the ostrich eggs I have and cover it in beads, just haven’t done it yet. Now, that would be a beaded egg! or even a cute little quail egg. How wonderful, lovely beautiful, awesome, terrific etc. I found Your post and showed to my wife who is beading and quilting. She said that these are wonderful. Thank You presenting these. thanks for stopping by. I will check out your wife’s beadwork! Would you mind if I shared a link to your page and one of your images on my Self Rescuing Princess Society blog? I do a weekly post entitled “She’s Crafty” and this is perfect for the pre-Easter post! I am fine with that (thanks for asking! ), as long as you link back to my post. I will go check out your SRPS blog. Sounds fun! Thanks! Happy Easter to you and yours! Emily, those are so pretty! I don’t do much beading but when I discovered proper beading needles, what a lifesaver! Have you ever tried the pisansky (sp.?) eggs? Thanks.No, I have not tried pysanky eggs. A friends sister did them for years and years and I got one for my birthday one year – still have it. They are beautiful. AND YES – beading needles are wonderful.